ATLANTA – Committed to giving dealers greater control and options for how and when they want to do business, Manheim is launching Manheim Express SM, a mobile app for dealers. Another 24/7 option within the Manheim Marketplaceä, Manheim Express is a fast, easy and self-service way for dealers to list and sell inventory right from their lots or in-lane in the world’s largest wholesale marketplace. 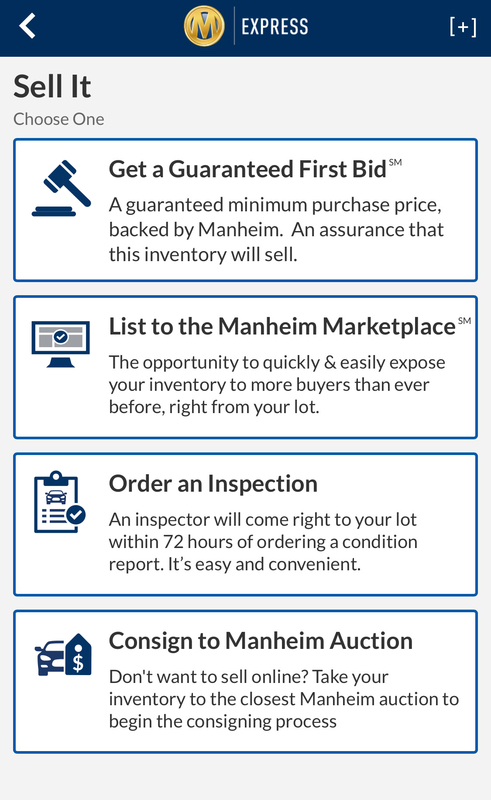 After completing a few quick steps in the Manheim Express mobile app, dealers will have all of the information they need to evaluate a vehicle so that they can decide to take a Guaranteed First Bid SM, list it in the Manheim Marketplace, order an inspection or consign it to a Manheim operating location. Load Vehicle Info via VIN Scan – In the new and free Manheim Express mobile app, dealers simply scan the VIN and are immediately presented the vehicle’s value from Manheim Market Report (MMR), AutoCheck Snapshot vehicle history report data, and manufacturer build data (where available). This information provides dealers the necessary information to make smart decisions on taking vehicles in on trade. Get a Guaranteed First Bid – Manheim Express offers the industry’s only wholesale guaranteed first bid (GFB). Driven from the industry-leading MMR, a minimum floor price is set and if the vehicle does not sell for the minimum floor price or greater after being listed in the Manheim Marketplace for 2 business days, Manheim will buy the vehicle at the GFB price. So, Guaranteed First Bid means that dealers know they can have a check in hand in two business days. Dealers can also be assured that their inventory is in the largest and most active market in the world, which experiences 58 million unique visits per year. List to the Manheim Marketplace – Simplifying the listing experience, Manheim Express allows dealers to walk a car and create a listing complete with the industry’s first and best-in-class, 360-degree images that can be uploaded into the Manheim Marketplace within three minutes. Manheim is partnering with computer vision company Fyusion to enable dealers to walk cars and create immersive, interactive 3D images, while also being able to apply smart tags to any damaged areas in under 3 minutes. Order an Inspection – Manheim research shows that vehicles with a condition report from an independent inspector are three more times likely to sell online. From the app, dealers can order a condition report and an inspector will come right to their lot within 72 hours, making inspections easy and convenient. Consign to Manheim Auction – If a dealer prefers to not sell the vehicle in any of the Manheim Digital Marketplaces, dealers can now send their inventory to the Manheim operating location of their choice via Manheim Express. “Manheim Express is another example of how Manheim continues revolutionizing inventory wholesaling and how Manheim Marketplace is uniquely positioned to meet clients wherever they are – even off their lots,” said Huang. Launching this summer, Manheim Express is one of several solutions that are being integrated into the Manheim Marketplace. 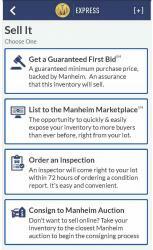 Manheim Marketplace has a variety of flexible, customizable solutions that allow clients to buy and sell right off their lots. Comprising Manheim.com, OVE and now ManheimExpress.com as well as OEM-specific marketplaces, Manheim Marketplace is the largest and most active market in the world.